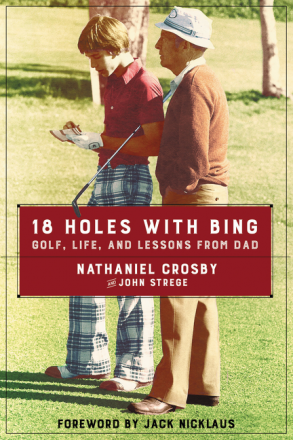 Written by Nathaniel Crosby, this is a warm tribute and touching memoir to his dad, the famous Bing Crosby, whose love of golf he shared with his son. Nathaniel Crosby, who dabbled for a short while as a professional golfer, placed 59th as the low amateur at the 1982 U.S. Open, held at his father’s beloved Pebble Beach. With a foreword by Jack Nicklaus, “18 Holes with Bing” is told in 18 enlightening vignettes, and is co-authored by John Strege. Crosby calls his Oscar-winning actor-singer father “the most popular entertainer of his day.” The numbers don’t lie. Bing Crosby sold more than half a billion albums, sang the hit single “White Christmas,” and filled venues right up until his death in 1977 at age 74. Throughout his successful career, golf was always an important element. The famous crooner started the Bing Crosby Pro-Am golf tournament in 1937 and said the sport was “kind of a passport to relaxation and happiness.” Nathaniel Crosby served as host of that tournament for eight years. Still held at Pebble Beach in central California, the event changed its name in 1986 to the AT&T Pro-Am. Within the 224 pages of “18 Holes with Bing: Golf, Life, and Lessons from Dad,” the author writes about the singer’s long friendship with fellow entertainer and golf fanatic Bob Hope, as well as Louis Armstrong. Other exclusive stories include Bing Crosby’s golfing, working, and playing with some of the most famous people in history, including Dwight Eisenhower, Ben Hogan, and many others. “Bing Crosby was a great ambassador for our game, as well as a great man,” wrote longtime friend and golf partner Jack Nicklaus in the book’s foreword. “18 Holes with Bing: Golf, Life, and Lessons from Dad” retails for $23, and is available at Amazon.